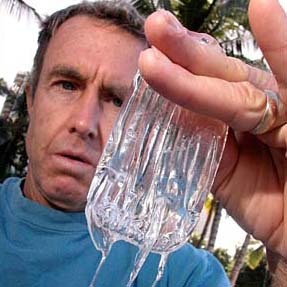 City lifeguard Landy Blair held up a jellyfish yesterday at Kuhio Beach. It was among 800 of the creatures collected at the beach yesterday, which he said was an unusually high number. »What, Russ Lynch, you goin' leave us now?